All our cruisers are the same design and layout and can be hired by a minimum of two persons and a maximum of six persons. 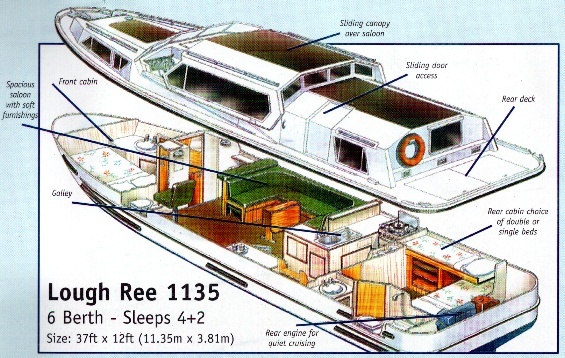 You have the choice of a cruiser with a double bed or two single bunks in the rear cabin. 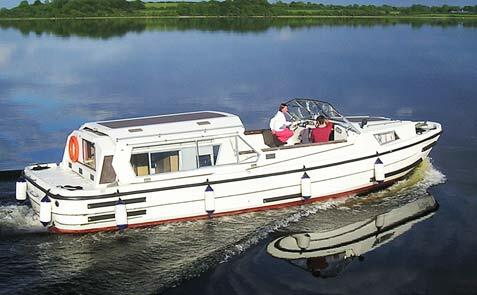 The distinctive feature of our boats is the 'Sliding Roof' which can be wound back over the rear cabin - giving you the option of open air cruising and dining. Headroom 6ft, double berth, dressing table with mirror, wash basin, wardrobe, en suite shower and toilet, warm air vent, shaver point. Headroom 6ft 3 inches, choice of cruiser models with double bed or two cross-over singles, wardrobe, warm air vent, shaver point. Separate Shower/Toilet with wash basin. 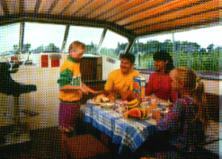 The spacious centre saloon and dining area is open plan with over 6ft 6 inches headroom. Large settee converts to double bed (6ft 6 inches long), folding dining table, warm air vent, ample storage, sliding roof for open air cruising and dining. Headroom 6ft 3 inches, gas fridge, household size gas cooker with grill and oven, single drainer stainless steel sink unit, ample shelves, drawer and worktops. Crockery, cutlery, bed linen, duvets, etc, all supplied.